Like other spring holidays, Sere Sal, the Yazidi new year, is about fertility and new life. 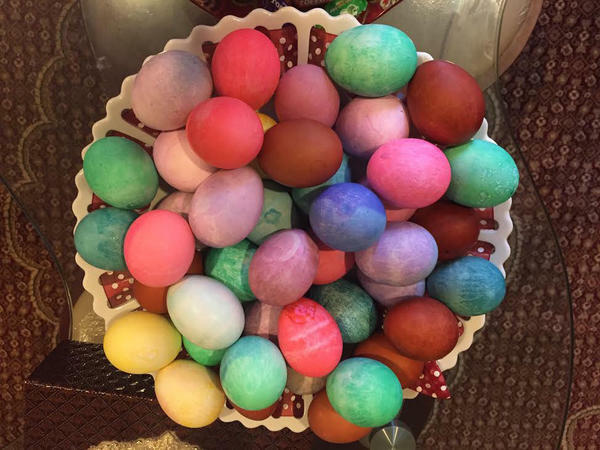 An ancient Kurdish religious minority, the Yazidis color eggs for the holiday in honor of the colors that Tawus Melek, God's chief angel, is said to have spread throughout the new world. Kolecha, fig-and-nut-filled cookies, are on the feast table at every eid. Nawaf Ashur Haskan says his brother always knew which family in their northern Iraqi village was making tashrib for the Yazidi New Year. He would arrive at that house at 11:30 a.m. knowing he would be urged to stay for lunch. Tashrib, a dish of long-simmered lamb, chickpeas and spices poured over flatbread, is served at holidays, weddings and funerals. Nawaf says it's also a great hangover cure. This year, Nawaf will celebrate Sere Sal (head of the year) April 18 in Washington, D.C., and his brother will have his tashrib in Amsterdam, Holland, far from the large family and neighbors with whom they shared the holiday for most of their lives. Six of their siblings are in Lincoln, Neb., and Germany, and their parents and two other siblings are still in Iraq. None of his family members still live in the peaceful rural community near Sinjar Mountain, where members of the ancient Yazidi religious minority have resided for thousands of years. Their life there ended in August 2014, when ISIS attacked, killing and abducting thousands. Nawaf's family managed to get to Kurdistan before ISIS closed the roads. While they left behind all their worldly goods, they took with them their culture, strongly expressed through food. Nawaf brought his cooking skills and passionate interest in food to my Washington, D.C., home, where he lived for nine months.Within a few days, he had taken over the kitchen. His wife, Laila, got out of Iraq six months later and joined him at the stove. Together, they cooked for workdays and for holidays (eids in Arabic), using the unwritten recipes passed down from one generation to the next. The family Facebook page features photos of holiday feasts from around the world. Cooking familiar foods is one way refugees can re-create home, wherever they are. Yazidi New Year – the second Wednesday after April 14 – commemorates the time when God sent Tawus Melek, his chief angel, to turn the Earth from liquid to solid. The Yazidis, who claim to be the first people created in the Garden of Eden, believe the angel manifested itself as a peacock and spread its brilliant feathers to color the new Earth. Like other springtime holidays, Sere Sal — also referred to as Charshem (which means Wednesday) — is about fertility and new life. Eggs are colored and their shells decorate Yazidi homes along with the red poppies that bloom this time of year. A special dish of chopped hard-boiled eggs and green onions sautéed in olive oil is always served. For the second year, Nawaf and Laila will celebrate with a group of Yazidis they met in Centreville, Va. They will play the games they grew up with and eat the same foods – tashrib or another lamb dish, soup with meat-stuffed dumplings, fresh salads, platters piled high with rice and couscous and plates of fruits, nuts and sweets. "But it is more formal," Nawaf says. For one thing, they will sit at a table rather than on the ground, as they would in Iraq. And the festivities will last for a few hours in one home, rather than a full day of moving from place to place visiting, eating, drinking and dancing. Nawaf grew up on his grandfather's sheep farm and says by Charshem, there would be about 50 healthy lambs on the farm. "We would choose the fattest one and my father would get up in the early morning hours to slaughter it," Nawaf says. "By 9 a.m., he would start making shawi, a barbecue of the heart, kidneys, liver and other organs, for breakfast." The bones and other meat were slow cooked with onions, garlic and dried limes for lunch. While the men are cooking and entertaining visitors who come to say eida ta piroziby ("happy eid" in the Yazidi Kurdish dialect), women go to the cemetery with special foods and sweets for those who have died within the last year. "They cry, they chant and then they visit and share food," Nawaf says. "It's like a big picnic." In suburban Washington, D.C., lamb comes from the market rather than the sheepfold, but the tashrib will taste like home. Bonny Wolf, a food writer in Washington, D.C., is writing a book about the celebration foods of Middle Eastern minority religions. Tashrib is the Arabic word for "soak," and this dish is based on bathing Middle Eastern flat bread with a spiced mixture of lamb, onions, garlic, dried limes and chickpeas. 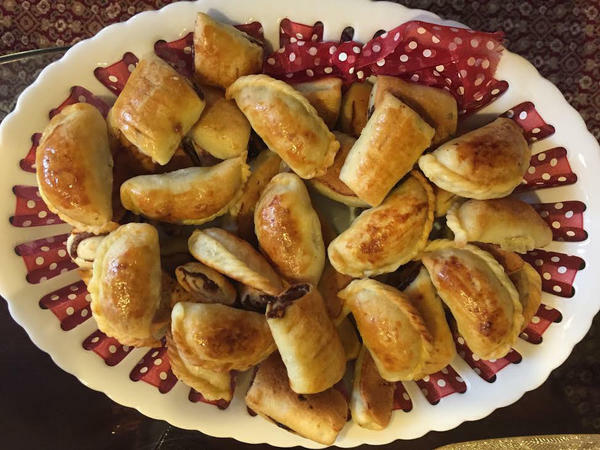 "Tashrib is more about the liquid than the meat," says Nawaf Ashur Haskan who, with his wife Laila Saleh, devised this recipe. It is cooked until much of the flavor has gone into the broth and is then piled onto torn pieces of flat bread and eaten with the hands. "Then you lick your fingers," Nawaf says. "That's where all the taste is." Canned chickpeas can be used but Nawaf and Laila prefer to soak dried ones overnight. Laila makes her own bread but there is a good selection at Middle Eastern markets and even some supermarkets. Naan or pita can also be used. Rinse the lamb, leaving a little water dripping from pieces and place in a large pot over high heat. Cover an cook about 2 minutes. Stir, cover again and cook, stirring occasionally, until the meat is well browned, 8 to 10 minutes. Meanwhile, boil 2 quarts of water and when meat is done, add water (should cover meat by about an inch), and chickpeas. Cook, covered, over medium-high heat until chickpeas are cooked through, about 30 minutes. Add onions, garlic, limes, baharat and more water, if necessary (liquid should just cover meat). Stir, cover, lower heat to medium and cook another 15 minutes. Taste for seasoning. To serve, spread torn bread over large platter and pour lamb mixture on top. Surround with lemon slices. *Both baharat, a seven-spice mixture, and dried limes can be found in Middle Eastern markets.